Today I got to do something a little different than teaching an avalanche course and returned to my roots so to speak… ice climbing! William, his son Billy, and close family friend Jeff have climbed with us a few times over the last few years. 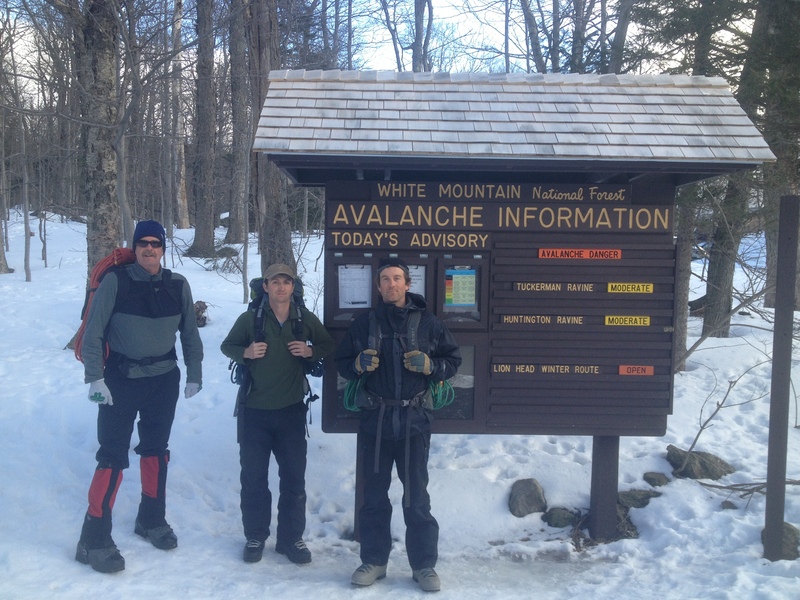 They’ve top-roped at Cathedral’s North End, sampled multi-pitch on Crawford Notch’s Willey’s Slide, and summitted Mount Washington via the Lion’s Head Route… but today they wanted an alpine gully. 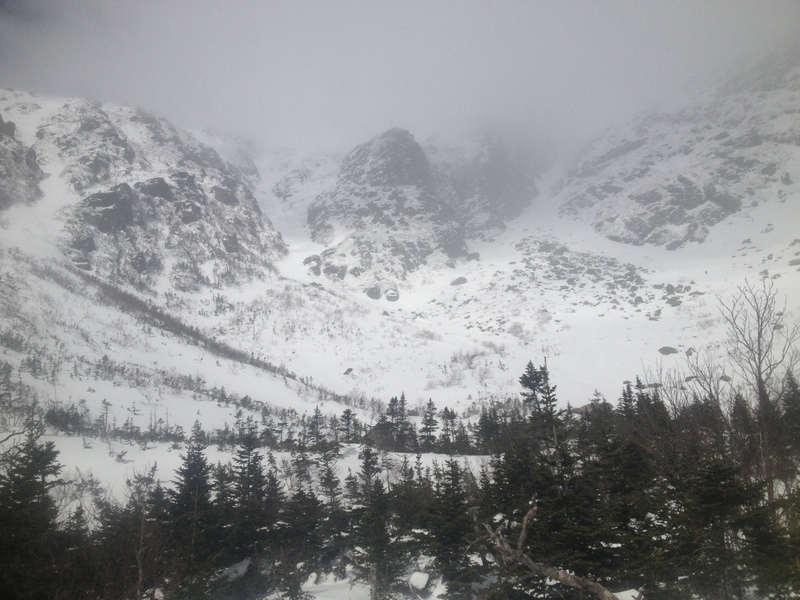 After gearing up with beacon, probe, shovel, and all the necessary technical gear for the climb, we made our way up to Pinkham Notch. 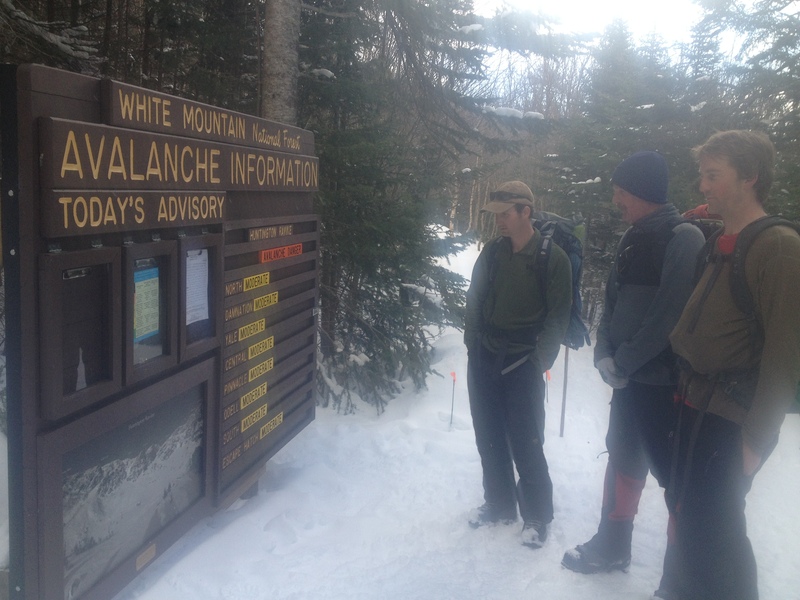 We made excellent time to Harvard Cabin in about 1.5 hours, where we obtained the updated avalanche forecast. 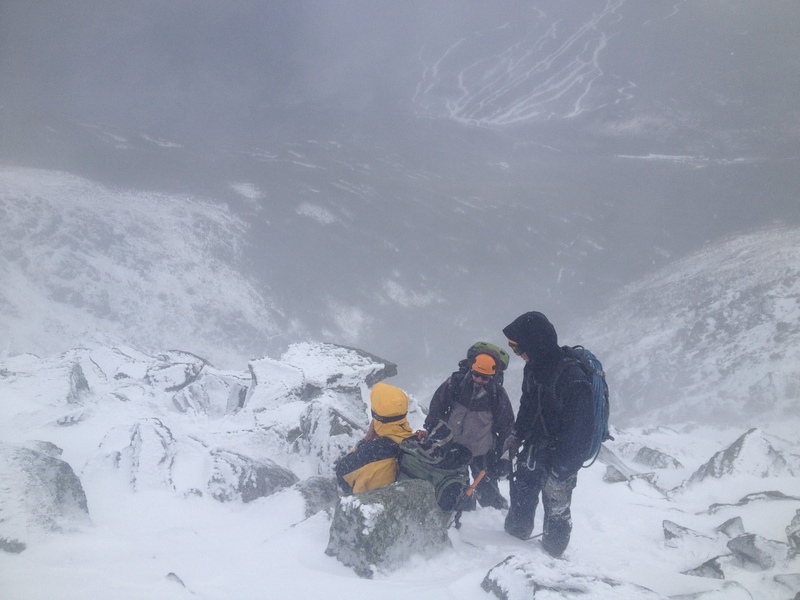 True “Spring” conditions have yet to visit Mount Washington as there was certainly a lot of info to ponder. 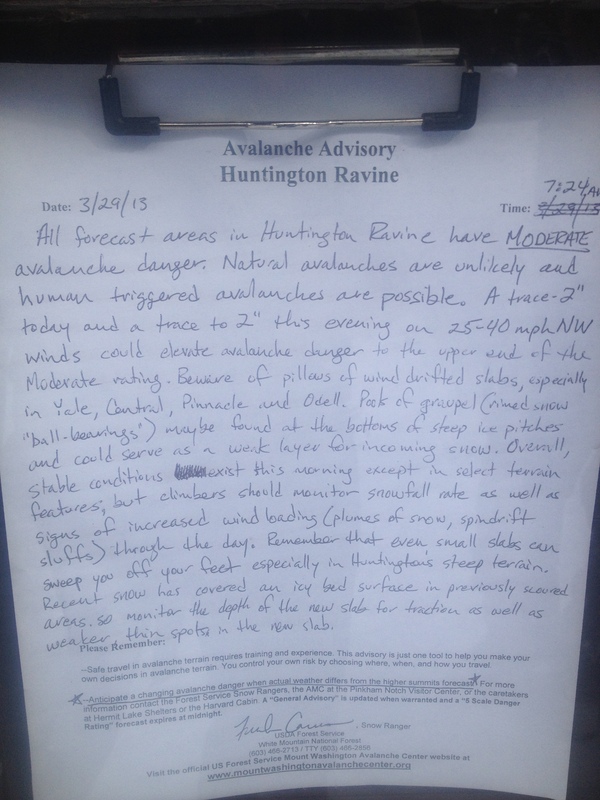 “Moderate” danger means “human triggered avalanches are possible”, so I was glad we were equipped with beacon, probe, and shovel, but quite determined to use safe travel techniques and terrain selection to NOT be involved in an avalanche. We made our way up into the floor of the ravine in just under two hours from leaving Pinkham. Here we donned helmets and harnesses, and conducted a quick beacon check to make sure everyone’s beacon was functioning properly. We then climbed up towards the mouth of Odell’s leaving the established boot pack to break trail in order to choose a safer line outside the run-out since we could see at-least 6 climbers in the gully ahead of us. 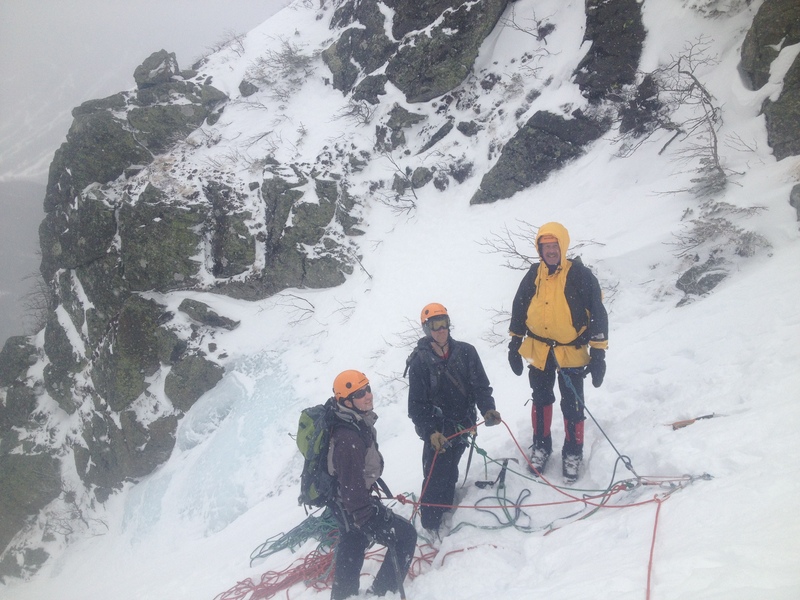 After reaching the start of the climbing we stomped out a ledge and crampon’d up. 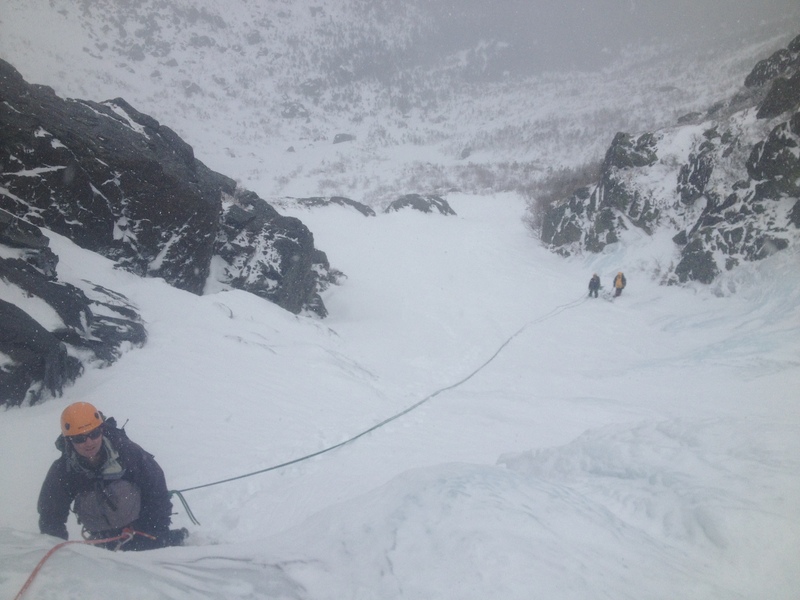 Out came the ropes and I led up an easy 190ft pitch of snow climbing on the left side of the gully. Within minutes we were all established on our first anchor. From here I crossed the first snow field to gain the steeper ice on the right side of the gully. While more challenging this reduced exposure from falling ice from the party of 4 above us, along with the avalanche potential when they reached the upper snowfields. 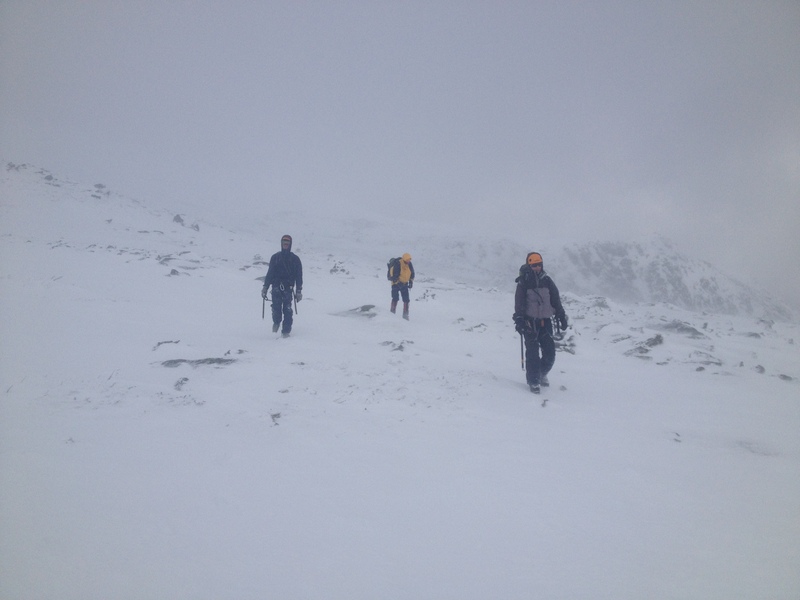 The next pitch was nice easy grade 3 ice, despite the constant spindrift from the graupel falling from the sky. The camera didn’t come out again until we reached the top as I was a bit busy managing 600 feet of rope and 3 folks a bit new to such a big climb. They were amazing BTW, constantly looking for ways to help the team complete the climb in a reasonable time. After the technical pitch it eased up a bit, and after a steep 200ft snow pitch I gathered us on a small ridge to the left of the steepest ice. We put away two ropes and I “long-roped” us up to the top-out. 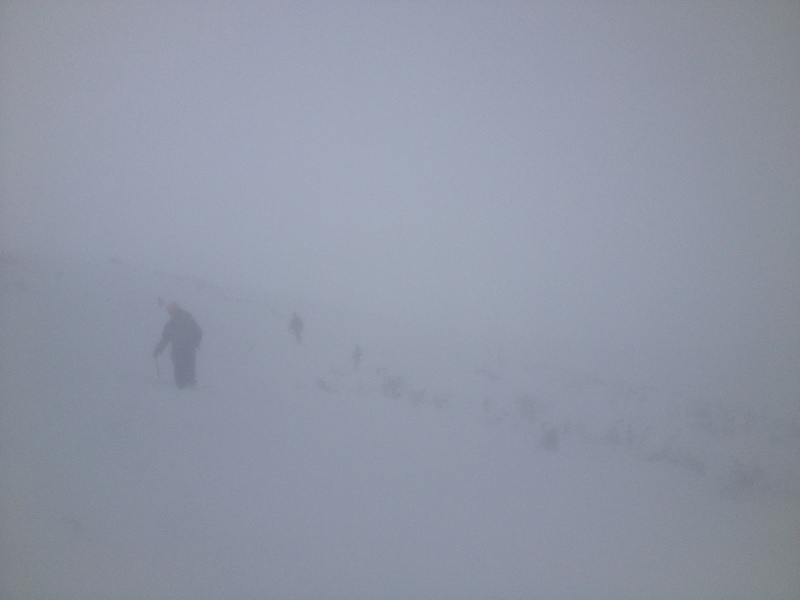 We stashed the ropes, grabbed our goggles, and made for the Alpine Gardens… and were pleasantly surprised… despite all the blowing snow and spindrift it was quite nice up there. We made our way towards the Lion’s Head Trail and contoured down a bit into Raymond’s Cataract to cut the corner and save some time. The snow was consolidated enough to make the travel pretty easy going. We soon caught a few groups gripped on the steeper sections of the Lion’s Head Winter Route, and they allowed us to pass. Further down we passed some folks in Yak-Traks and Blue-Jeans, sigh… but made it back to Pinkham in good time. It was great to swing the tools today, as I have climbed less ice this season than I have in the last 10 years as I have shifted so much focus to running avalanche courses. It was made even better by doing it with such a cool group of adventures guys! Bill, Billy, Jeff, hope to see you again! And everyone else, it’s still winter up here! Last avalanche course of the season starts tomorrow!